You could say that this day is one that has been a year in the making, but that would reduce the situation that the computer company Dell finds itself in to pretty simplistic terms. Those conversations in time led to a series of meetings that led Michael Dell and the private equity firm Silver Lake to offer to buy out 100 percent of the shares of the company for $13.65 per share. The transaction includes $2 billion in debt financing from the software company Microsoft and, all in, would value the company at $24.4 billion. That offer was the sixth from Dell and Silver Lake, made after no fewer than 25 meetings. Their first offer was $11.22 a share, and was increased six times throughout the negotiation process. Those who have argued in favor of the buyout plan have these facts on their side: The price offers a 37 percent premium over the company’s average closing price during the 90 days prior to the day when word first broke that a go-private transaction might be pending. It’s also a 25 percent premium of its closing price on the day before the first reports broke. Since then it has become clear that the personal computer industry on which Dell’s foundation was originally built had deteriorated to a condition not seen in its history. Sales have now declined for a record five quarters, and a painful industry retrenchment is now in full swing. Once the world’s market leader, Dell has settled into a distant third place behind China’s Lenovo and Hewlett-Packard on a global basis and number two in the U.S. market behind HP. In that time, Dell’s business condition has only worsened. During a 45-day go-shop period engineered by a special committee of the company’s board, the private equity firm Blackstone briefly flirted with the idea of buying Dell out at a higher price, but it never got serious and was probably more about other more complicated issues specific to the private equity industry anyway. Where Blackstone went away, Carl Icahn, the billionaire activist investor, has not. He has stalked Dell with a campaign fueled by his unique admixture of shareholder outrage, financial engineering, and with the judgement of a practiced publicity hound. His many “open letters” to shareholders have been as entertaining as his phoned-in objurgations to TV networks, usually carried live, and both have at times made actual news. The choice before shareholders is a complicated one for many reasons. 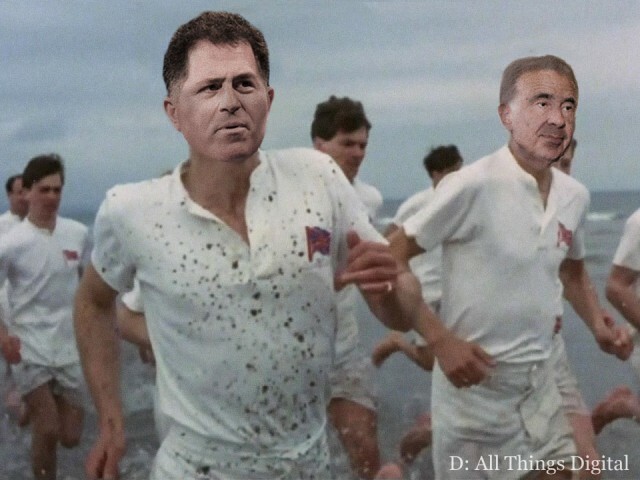 On one hand, Michael Dell and Silver Lake have offered a simple transaction that, as Institutional Shareholder Services put it in its report endorsing the deal last week, a buyout now would transfer to them and them alone the uncertain risks associated with a turnaround that could take years, if it succeeds at all. Icahn has offered a more complex recapitalization. He has offered to buy up to 72 percent of Dell shares at $14 each, and use existing company cash and new debt to pay a special dividend to shareholders. Also last week, Icahn added a new inducement of warrants to buy new shares at a strike price of $20 sometime in the next seven years. It is, Icahn has argued, a transaction that would give existing shareholders a choice to sell some or all of their shares, but also to share in the fruits of a hoped-for turnaround someday. One thing Icahn has made clear: Michael Dell will not be CEO of the company he envisions, and has even suggested names of people who might replace him. So what’s likely to happen? A lot of things could happen. Here’s some scenarios, in no particular order. Option One: Dell shareholders approve the buyout proposal. If this happens, it might seem pretty clear that Icahn and other shareholders in his camp have been defeated, the buyout would proceed unencumbered. Don’t count on it. Icahn has at various times threatened to resort to the courts to fight the buyout, and as the company’s second-largest shareholder he has enough skin in the game to play for keeps. Shareholders who do not vote in favor of the buyout have certain rights under Delaware law (where the company is legally incorporated) to demand an appraisal by a judge which would determine what the company is really worth. Icahn has called this approach a “no brainer” because he says it allows shareholders to benefit from the buyout and still hold out hope for a higher payout later. But the fact is that these appraisal rights carry a great degree of risk. Basically, if the buyout is approved, don’t expect a smooth closing. Option Two: The buyout offer fails to win shareholder approval. If you thought option one was complicated, you ain’t seen nothing yet. Where the outcome of the first is likely to be complicated, the scenarios raised by the second option are exponentially messier and unlikely to conclude any time soon. For one thing, Dell and its special committee have argued that if the buyout is not approved, Dell shares will fall, and not just a little but a lot. When its valuation multiples are compared to rival Hewlett-Packard, the argument goes, Dell shares should be trading at somewhere in the range of $6 to $8, and nowhere near the $13 level at which it has been hovering. With neither the Dell/Silver Lake buyout nor the Icahn recapitalization plan on the table, Dell as a company would be forced to carry on amid ongoing questions about its strategy and direction. The resulting confusion might take a year or more to resolve in any meaningful way. Option Three: No vote takes place. There have been numerous reports that the special meeting of shareholders might be called to order and immediately adjourned without a vote on the buyout actually taking place. The intended effect would be to delay the vote for several days, perhaps a week, in hopes of convincing more shareholders to vote in favor. As The Wall Street Journal points out, for legal reasons, this is an easier tactic than simply not calling the shareholder meeting to order at all. As of early Thursday morning, this seemed the most likely outcome, but it only puts off a vote for a few days. If a delay occurs, pressure will begin again on Dell and Silver Lake to raise their bid. Sources familiar with their thinking say this is something they are steadfastly unwilling to do. Icahn has, on the other hand, revised his offer upward new fewer than four times. Meanwhile, the list of shareholders said to be opposed to the buyout has continued to grow, and now amounts to more than 28 percent, more than half of the 43 percent majority needed to approve the deal. 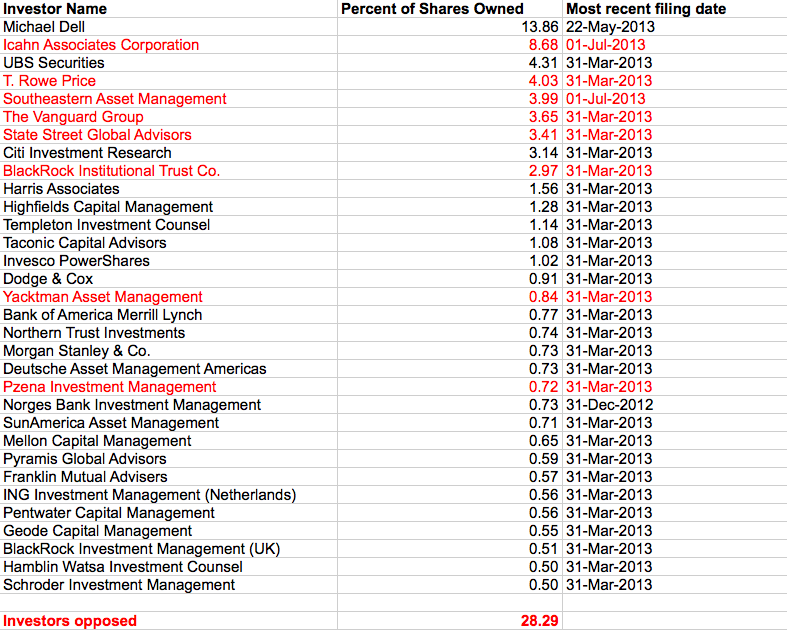 The table below shows the top Dell shareholders who own at least one-half of one percent of its outstanding shares. Those known to be opposed are highlighted in red. If a vote is indeed held today, it is still expected to be close.